0 Quaternary 0.01 Subtropical forests gave way to cooler forests and grass areas. Jurassic 195 Climate warm and stable. High reptilian diversity. Birds first appeared. Triassic 240 Climate warm. Extensive deserts. Dinosaurs replace mammal-like reptiles. First true mammals. Extensive shallow seas Warm climate. First terrestrial arthropods. First jawed fish. marine invertebrates. Jawless fish widespread. Cambrian 570 Extensive shallow seas and warm climate. Trilobites and brachiopods common. Earliest vertebrates found fate in the Cambrian. Archean 4,600 Prokaryotic life appeared (3,500 million years ago). Origin of the earth (4,600 million years ago). 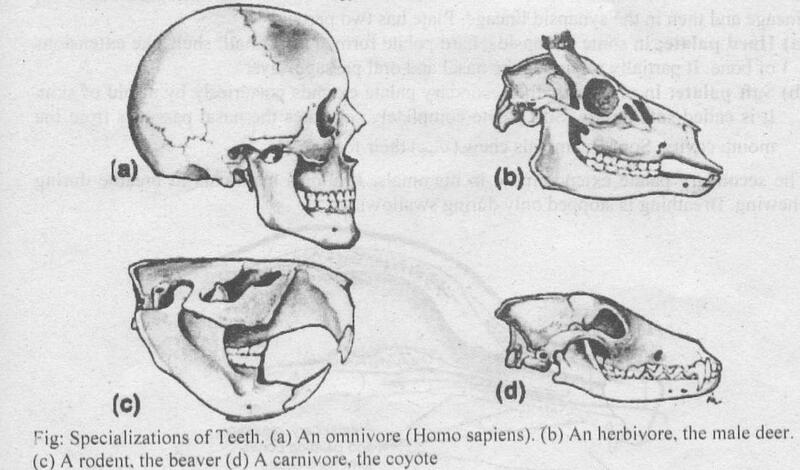 (a) Homologous structures: Structures derived from common ancestry are called homologous structure. 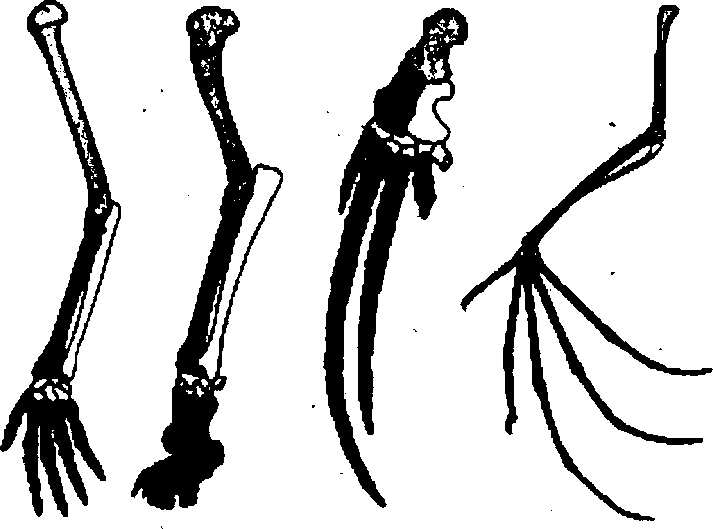 For example, vertebrate appendages have a common arrangement of similar bones although some of them perform different functions. 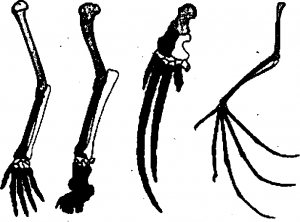 This similarity in appendage structure indicates that the vertebrates evolved from a common ancestor. (b)Analogous structures: The structures having different origin but performs similar functions are tailed analogous structures. 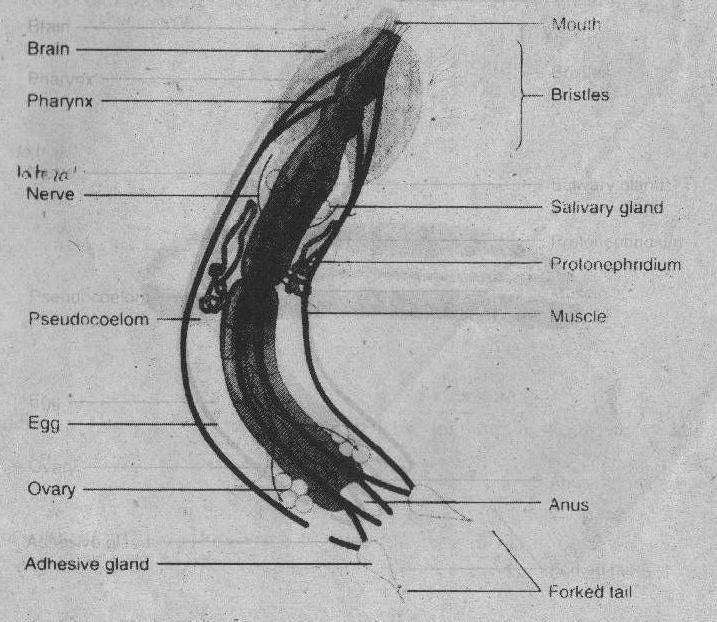 Analogous structures are produced due to convergent evolution. Convergent evolution occurs when two unrelated organisms adapt to similar conditions. It causes superficial similarities in structure. For example, the wing of a bird and the wing of an insect are both adopted for flight. But they are not homologous. These structures are analogous. Molecular biology has provided a lot of important information about evolutionary relationships. The animals also have homologous biochemical processes like homologous structures. 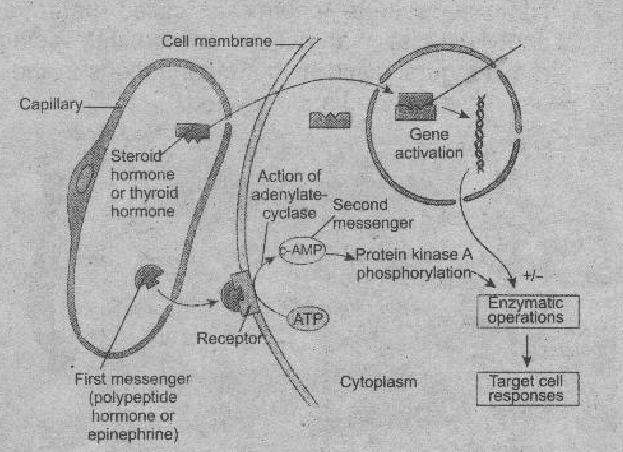 Structure and function are based on the genetic DNA molecule. Related animals have similar DNA derived from their common ancestor. DNA carries the codes for proteins. Thus related animals have similar proteins. The zoologists extract aid analyze the structure of proteins from animal tissue with the help of latest laboratory techniques. They also compare the DNA of different animals. They look for dissimilarities in the structure of related proteins and DNA. It gives – constant mutation rate. In this way they estimate the time since divergence from a Common ancestral molecule.